Rep. Alexandria Ocasio-Cortez (D-NY) told comedian Stephen Colbert that she doesn’t care about pushback she’s receiving from fellow Democrats over her ambitious agenda. 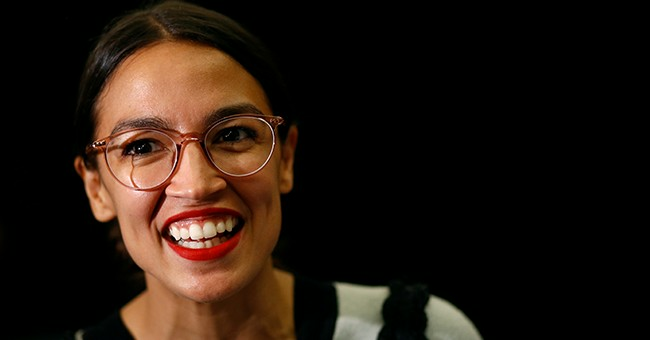 In fact, she cares so little that she told the host of CBS’s “The Late Show” that she gives “zero” f***s.
“Now, congresswoman, for you and other freshmen members of Congress, you're getting a fair amount of pushback from even members of your own party saying ‘wait your turn, go slow, don't ask for so much so fast right now, you're new, wait your turn for everything and don't make waves,'" Colbert said to the democratic socialist on Monday. “I want to ask this question in a respectful manner, knowing also that you're from Queens, so you will understand this question,” he continued. “And the BX,” said Ocasio-Cortez, who’s from the Bronx. “On a scale from zero to some, how many f***s do you give?” he asked. Pausing, Ocasio-Cortez reached to her side, pretending to pull out a zero, and made a circle with her hands. “I think it’s zero,” she said, laughing. “That’s my thought!” Colbert replied. “It’s how we choose to interpret items and how we choose to interpret events and things like activism and advocacy,” she replied.